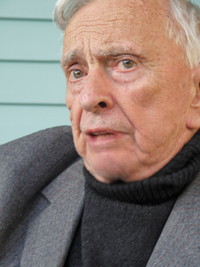 Gore Vidal (1925-2012) was one of America’s most distinct voices for more than half a century. The author of more than 20 novels, hundreds of essays, and several plays for screen and stage, Vidal was perhaps best known for the eloquent and witheringly sarcastic political commentary that made him a darling of the American left. With dependably erudite attacks on right-wing figures, this quixotic scion of a privileged political family, friend of the Kennedys and playwright Tennessee Williams, staked out a unique position in American political and intellectual life. This recording from the 2009 Key West Literary Seminar consists of an hour-long conversation between Vidal and Jay Parini, a poet, biographer, and critic, as well as Vidal’s literary executor. Vidal discusses the influences on his work as a historical novelist, his views on the American educational system, and his admiration for figures including Benjamin Franklin, Abraham Lincoln, and Franklin Delano Roosevelt. George W. Bush, then serving his final week in office, is the target of particular scorn, as Vidal levels a litany of complaints accusing his administration of “shredding” the Bill of Rights and striving “to make lying the national pastime.” In a question-and-answer session, Vidal discusses efforts to bring Tennessee Williams’s final play to the public, as well as his feelings on disgraced financier Bernard Madoff and former vice-presidential candidate Sarah Palin. From KWLS 2009: Historical Fiction and the Search for TruthThis recording is available for noncommercial and educational use only. All rights belong to the author. © 2009 Gore Vidal and Jay Parini. Used with permission from Gore Vidal and Jay Parini. I would like my students to listen to this.